Hello All. I am already on my second post, and so far the response has been humbling. Thanks to everyone, who visited my Blog. It really means a lot. My topic for the second post was too easy. I had thought about it, even before I had conceived my first post. I started my blog, with the mention of my God, so for my second post, I choose - the God of Sarees. Ladies n gentlemen , please bow down to the God Of Sarees - Satya Paul. Satya (literal meaning truth) Paul was on born 2nd Feb, 1942 Leiah Muzzafargarh, which post partition is now in Pakistan. He is a self made designer, entrepeneur and truly a poineer who started his career at a very young age without any formal training in art. He opened his first store in new Delhi in 1965, started exporting in 1975 and launched the Satya Paul label in 1985. He currently runs his company called Paul Salon which creates some of the most amazing and crafted accessories, home textiles, furnishing fabrics for international markets. Satya Paul is the first designer label in India to brand sarees with designer’s logo and to exhibit their collection in the format of fashion shows. 27 years since its launch, what has remained constant is the passion, excellence and innovation of the brand which still makes it the Mecca for Saree Lovers. I had the pleasure to read his interview some time ago where he quoted:"The sari is one of the most beautiful and one of most ancient of dresses. This is also the only dress that takes the shape of the woman who wears it.The sari has 'feminine poise and grace in it'. Even when a poor lady wears it she looks richer." I couldn't agree more. It is his love and sincerity towards this garment, that has helped put saree on the world map. I could just go on and on talking about him, but its better if I allow his work to speak instead. I so love his designs, that I can keep posting millions of pics of his sarees. I have posted only some of my fav picks, which I had saved in my personal folder over the years. Hope u like them. A saree made up of the Google web search results. I love this Saree and I love Google. designed for Mandira Bedi during World Cup 2007. A Signature Piece from Satya Paul. 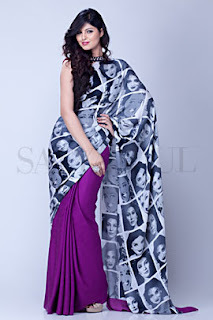 A Saree with the pics of Bollywood Beauties. for the Vogue India October 2010 issue. Good information & very good effort Aditi. I too like Satya Paul sarees... Not each and every one though. Coz I dont think I can carry his style. And Aditi, gal you are so fluent with your subject. Thanks Shivali. I m not yet fluent with my subject, but i intend to thru this blog. It's a learning experience for me too. Thanks Nickita. Appreciate your comments. Valuable post and very well written. Thanks for sharing.